And what about when art isn't so pretty? What about when you don't get your perfect pin out of the result? Adults often prefer to give kids cute crafts projects because the nearly cookie-cutter perfect results reflect well on the adult. (If the child's work looks good, then doesn't this mean the adult is doing a good job teaching?) The truth is actually the opposite: If a child is exploring and discovering while creating art, the child is learning far more than if he were merely copying an adult's idea of a finished product. Creating through open-ended art places the value on the process rather than the final product. 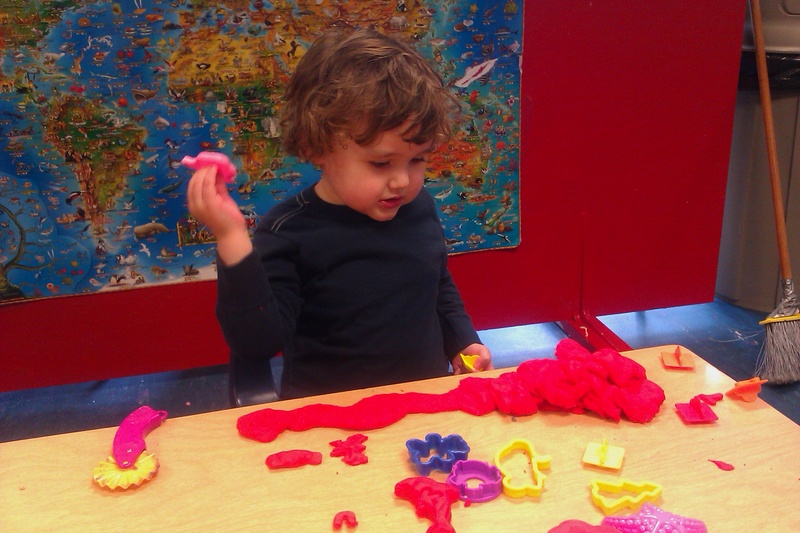 […] For young children, the exploration and discovery is foremost, and the finished product may not even exist! Sometimes children will value the finished artwork as a by-product to their creative explorations, and sometimes it is a way of telling what they experienced. Other times they set it aside and start something new — because it was the doing that mattered, not the outcome. I can attest to that, a hundred times over. For instance, Alrik's big right now on fringing foam paper with scissors. But he shows no inclination to have us hang up his fringed works — he's just practicing his mastery of scissors over paper. 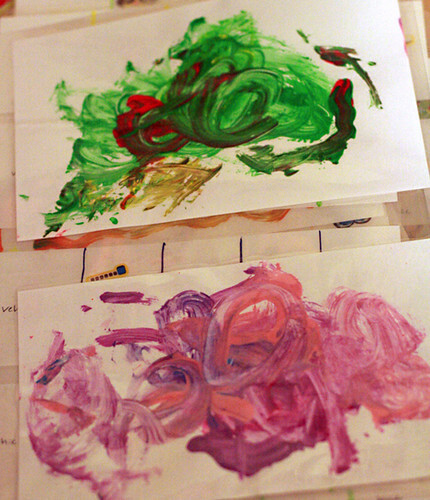 Mikko colors over my attempts at a Thanksgiving craft. MaryAnn's article is not a set-down of crafts, however. She admits crafts have their place. For instance, we recently had the boys make mosaic frames for their grandparents — Sam set out a pile of sea glass and had both boys arrange the pieces however they wanted onto two blank picture frames. Sam then glued the pieces in place (he handled it since it was a super-sticky glue) and then had prints made of the boys with their grands to put inside. 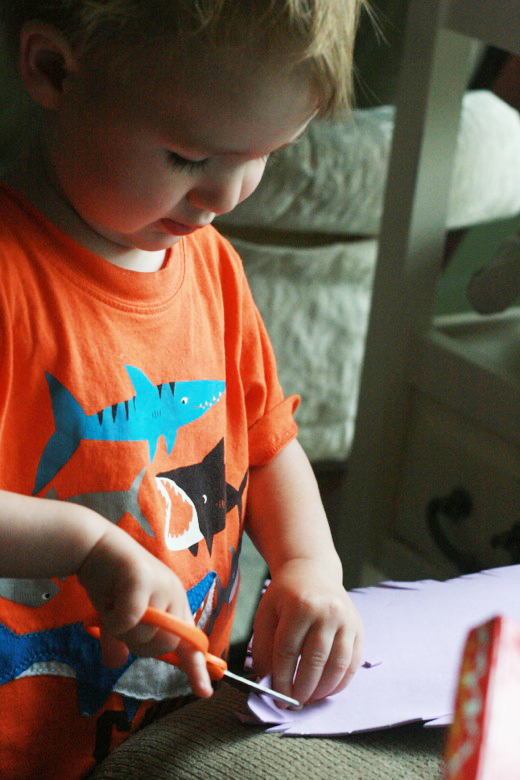 Crafts can be special and purposeful — but free-form art should be prioritized in a child's life. Crafts often have practical uses or are meant to reinforce a specific topic or learning theme in the classroom like safety, pets, or transportation. 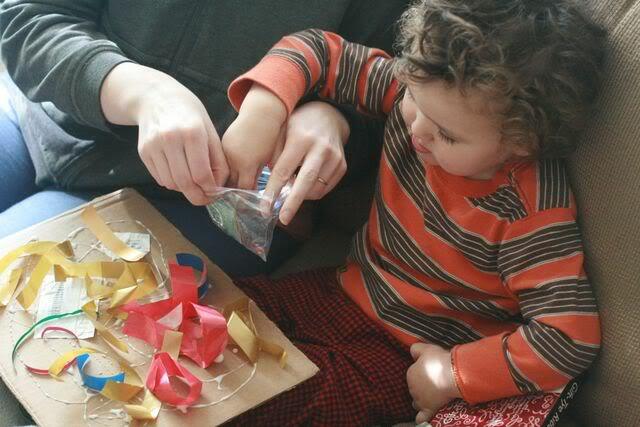 Crafts may go along with Math, Science, or other academic areas. When making crafts, children are often forming useful items or following directions to make projects or things that other kids are making too — even if they don't look exactly identical when complete. There will be uniformity to the work and an expected outcome for all participants. Crafts are designed to please adults as much as to offer children specific facts to learn or to reinforce the exercise of following directions. It's not that crafts are bad; it's just that crafts are not art. 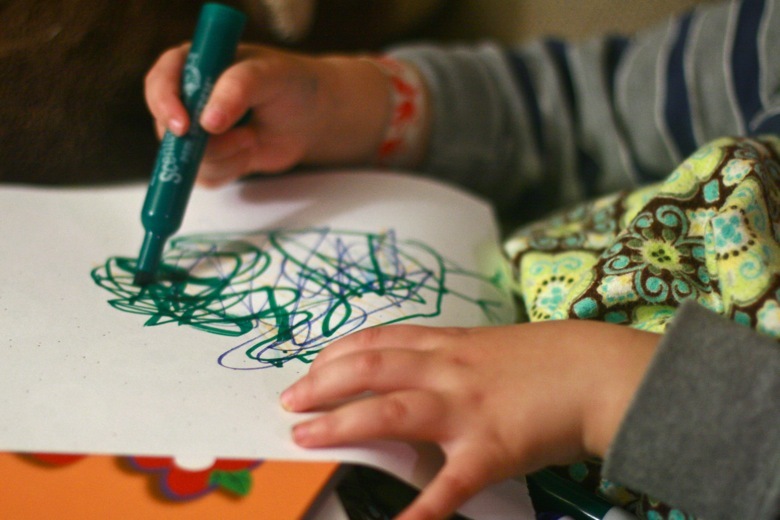 Use the word "art" when children create art, and "crafts" when they do crafts. This way, everyone understands the difference and learns to respect each activity for what it truly is. Crafts are fun and cute and a supplement to a child's learning and doing, but art should be the larger portion of a child's creative time. That seems fair to me, and a place where I'll try to watch my language. It reinforces my preference of blank paper over coloring sheets and my liberal purchasing of a variety of materials over specific kits. MaryAnn finishes her article with a real-life example of art vs. craft: the difference between creating a free-wheeling collage vs. expecting your children to glue cotton balls on a plate in the form of a bunny. It makes me consider that all those times I was trying and failing to get my kids to glue their cotton balls into the shape of a bunny — they were actually just giving me a lesson in what art truly is! Crayola Washable Super Tips, 20 count — Our kids like that these are fine tips so they don't get in the way of drawing details, and they're still a good length to grip. 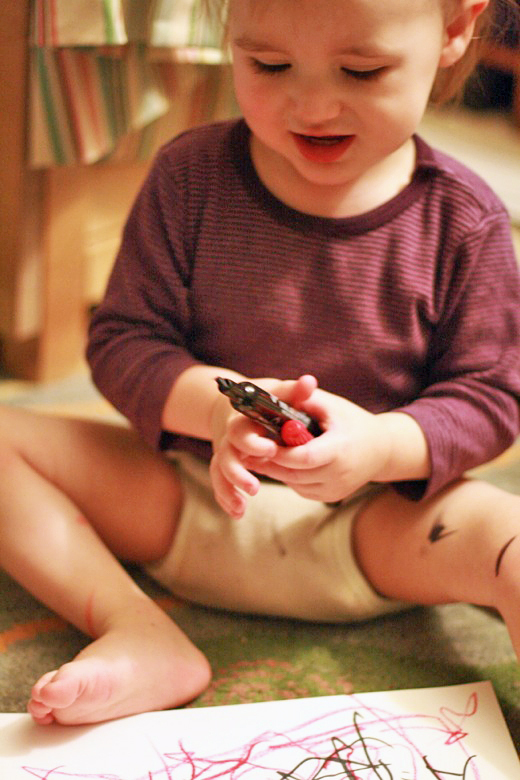 My kids have never been crayon fans; they prefer the vibrancy of markers. Whereas I like that these wash out of laundry! There's a nice color assortment, and the bonus for the 20-pack is it comes with 5 scented markers. I don't know why that's such a treat to me, but it totally is. One downside is it's easy to lose the caps because they don't really stick on the ends. We keep a plastic baggie around to pop in errant markers or caps until we find their matches so there's no drying out. SunWorks Construction Paper — I mean, I have no brand preference here, just saying that construction paper is awesome. Crayola Sketchbook — But then you need to have plenty of plain paper around, too, for those projects that need a blank canvas. We use (and reuse) computer paper, but the kids do like having bound paper as well — notebooks and sketch pads. Plus, they travel well, even if you're just traveling to the grocery store. Westcott Soft Handle Kids Scissors, 5" Blunt — These say blunt, but thank heavens they actually cut! I can't stand (and couldn't as a kid, either) the super-blunt scissors. The worst are the ones with plastic blades; these are metal. Kids shouldn't have to work at sawing through construction paper as they're practicing their scissor skills. We have several different brands of scissors (we tend to lose them…), but I do happen to know we liked these. Foam Sheets — This is one of those random supplies that my kids really dig. You can find big packs of them at Michael's, and sometimes in fun shapes, too. Chenille Kraft Preschool Paint Brush Assortment — … these brushes. Bam! Do A Dot Art Markers — If you're severely mess-averse or just don't have time that day for clean-up, my kids also enjoy these paint pens. They're not quite as versatile seeming as paintbrushes (they can be, but kids tend to limit themselves to dots and lines), but they're certainly low mess and still fun. They come in a wide range of colors. Crayola Twistables Slick Stix — I just got to try these out while babysitting at Shannon's, and I really enjoyed them. They're a fair imitation of pastels without hands getting completely covered. The colors are intensely vibrant — so sort of a hybrid between crayons and markers. Roylco Paper Popz — Ok, I have no idea what these are, but they look fun. They're really just representing a category of art materials I would call collage supplies. 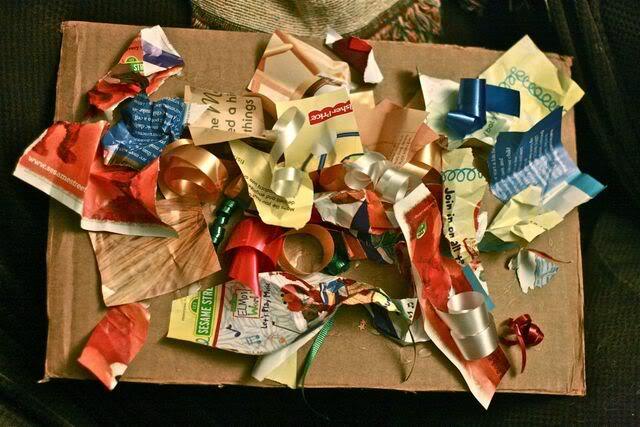 I like to have on hand an assortment of paper scraps (cut up your old projects for colorful options), stickers, feathers, ribbons, recycled packing materials, and more, to be used with the above glue and papers for … whatever. Xyron Create-a-Sticker 2.5-inch Sticker Maker — I mentioned before we sort of accidentally bought this. It has been a huge hit. If you want your kid to while away an afternoon and can afford something a little out of the norm, break this puppy out. 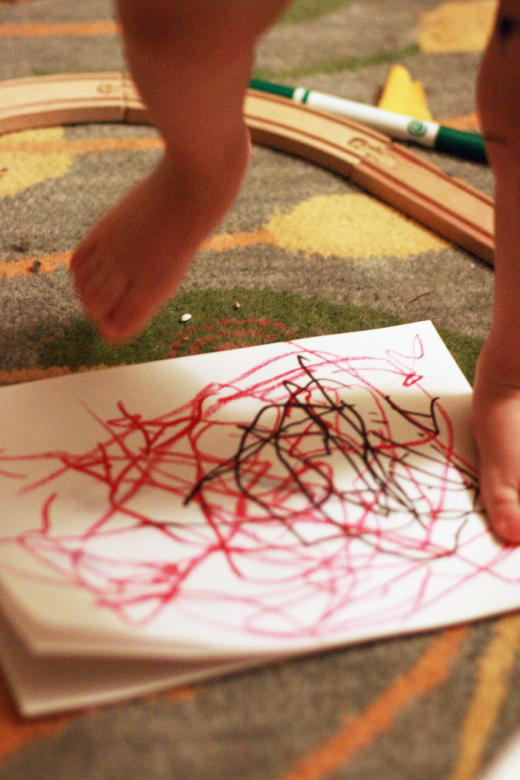 How do your kids approach art vs. crafts? Do you feel like you have a good balance in your home? 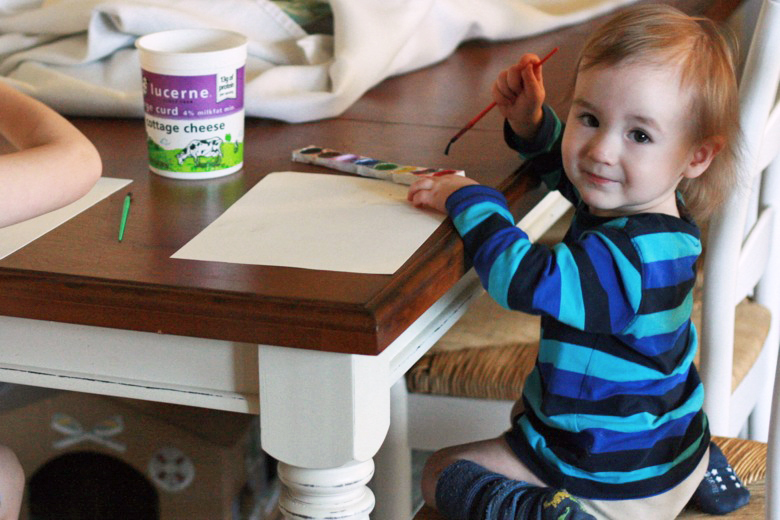 Do you think art is represented as well as crafts are on Pinterest and parenting blogs? If you're interested in exploring the art of clay sculpture and modeling with your children, be sure to check out the bundle I've helped organize, which includes MaryAnn's book Mudworks: The Mindful Play eBundle Sale. The Mindful Play eBundle, incidentally, ends TODAY. That's right — it's your absolute last chance to get 9 e-resources that will inspire your family's creativity and play for 80% off the cover prices! So head on over to the site to read more about each resource (tout de suite! ), and then add it to your cart while there's still time. This sale ends TONIGHT as the clock strikes midnight! Go go go, my artsy Cinderellas! About the Author: MaryAnn Faubion Kohl, award-winning author, publisher, and educational consultant, has devoted her professional life to children's art and creativity. Her philosophy, "It's the process, not the product," guides her writing as she provides open-ended art activities for children of all ages. 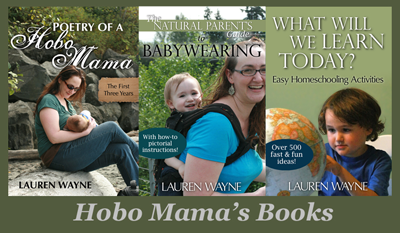 MaryAnn's books focus on the child's exploration and experience of art, not the final product. You can find out more on MaryAnn F. Kohl's website. We are definitely "art" and not "craft" people here. I keep coming back to this quote I love, but have no source for: "If you can do it wrong, it's not art." In my mind, a "craft" is something that you can get wrong. Art, however, just is. @Momma in Progress: LOVE that quote! Hm. I'm not a fan of this semantic distinction between "arts" and "crafts," myself. I am a crafty person (I love to make useful pretty things) and I live with a bunch of people with MFAs who studied "fine art" and I get annoyed at how "art" is used in a high-brow way, whereas "crafts" never seem to get any love! That said, I love a good mess! Arts or crafts ... I do think we all have to relax our standards and be more free-form sometimes (other times, it's good to have structure). I have been getting my kids more involved with my sewing lately, and it's a fun mix of free-form and structure - they spray the paint on the fabric or use markers, or arrange pieces, and I execute the final product. It's collaborative and really fun! @Inder-ific: It might help you to know that in her original post (which I cut so I didn't make everything even more tremendously long), she made a clear distinction between "crafts" and "craft" as well — that there is great artistic & practical value in, say, sewing, basket weaving, canoe carving, etc., and I agree. For her, "crafts" in this distinction are "finite and goal-oriented projects adults make kids do." Or something along those lines. We've been having sewing fun here, too. I like your style! @Lauren Wayne Yes, I actually did follow the link to the original article, and I saw that reference. My objection is purely semantic - I don't like that "art" tends to mean something lofty and pure and "crafts" tends to be used in a more pejorative way. Just a minor, finicky issue, but one that always bugs me a little. The underlying message is one I can get behind! 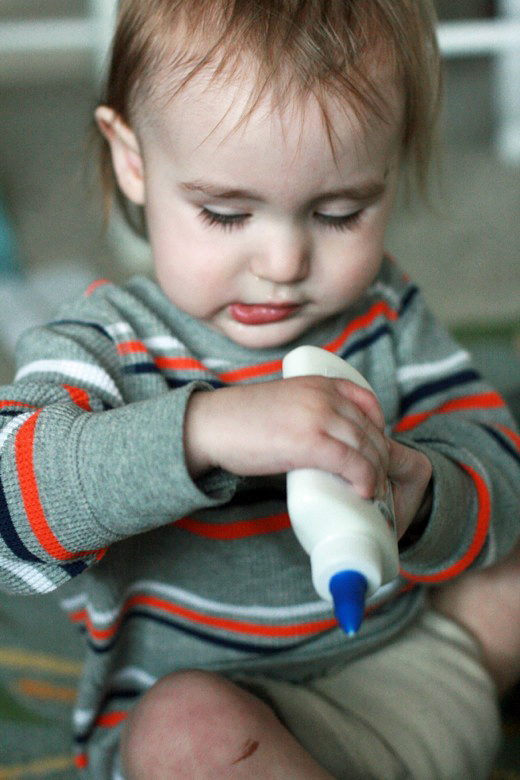 I bought those twistables on a whim for a trip when Moira was not quite two, and loved them, although we did discover that they will leave vibrant marks on any thing, and Moira had a little too much fun rolling them up into the lids and smushing them. I figured it was time to let Davis have a turn with the squishy fun. 1) I want to thank you for linking to the book Scribble Art. I am pretty sure I checked it out at the library a long time ago (5 years), and I was wanting to get it again, but I had no idea what the book was called. Honestly it is pretty weird that it popped up in my feed. 2) We do quite a bit of both around here. Allie is pretty particular about both her arts and crafts. Sometimes she wants to execute her own vision, and other times she wants to reproduce something she has seen elsewhere. As for definitions I wonder where technique falls? If you are learning specific techniques for drawing would that be an art or a craft, or something else altogether? Around here it depends on the kid. Mr. Pre teen is A.D.D and A.D.H.D so he needs structure. He loves directions. Whereas Mr. Sunshine (4) loves a blank slate. For example, tonight we're painting pumpkins and I've already told Mr. Preteen because he is so indecisive that he'd just stare at the pumpkin. He gets that from me. I have to find something to do on Pinterest. I rarely can just create. Now Mr. Sunshine will take a glance at that pumpkin and be like "magnificent! ", Let's do this!